THESE ARE SO GORGEOUS!! i love nothing more than milk and cookies, but these just take it to the next level! 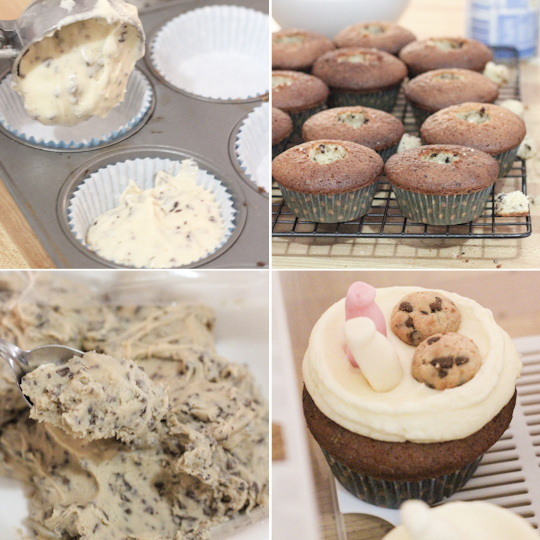 i love your super sweet baking style, it's so playful and interesting! i too, am a massive fan of miniature food jewellery... my favourite is my miniature pink macaron ring! holy moly. so much drool happening right about now! <3 milk bottles! You are amazing! I want to eat those cupcakes right off the screen. Super cute idea, I love it! I'm a big fan of mini cookies as well (you know, Famous Amos, Charlie's Cookies, the Chips Ahoy etc), so these look perfect for me! I love food-shaped jewellery too - have you see the Japanese brand Q-Pot? They're super cute and realistic! I think you might like them. :) I have a macaron necklace and a cupcake necklace from them! 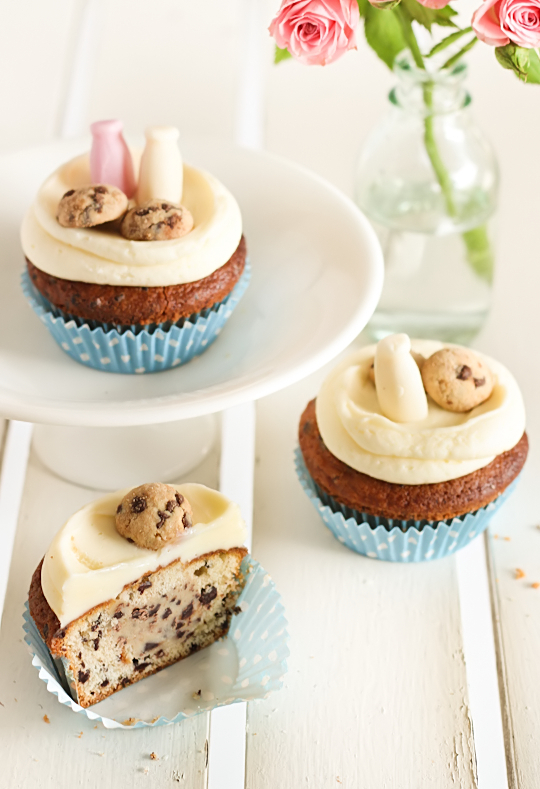 When I first saw the photos I thought that the cookies and milk bottles were super cute, then I realised that there was cookie dough in the actual cupcakes!! too awesome! I have never commented on your blog before. But I've been following for either a year or two (via bloglovin). Today, I HAVE to! I love your pictures! They've gotten better and these action pics really make me look forward to trying my hand at baking something I'm not really used to (I'm particular haha) but your styling is amazing! You inspire me to be more bright in my baking! Thank you for having a blog. I hope you are blessed in all other areas of your life as you are blessing ours with your blog. Delicious. We had milk and cookies at our wedding - here's a photo: http://pinterest.com/pin/184999497163738296/ and it was the best thing ever! 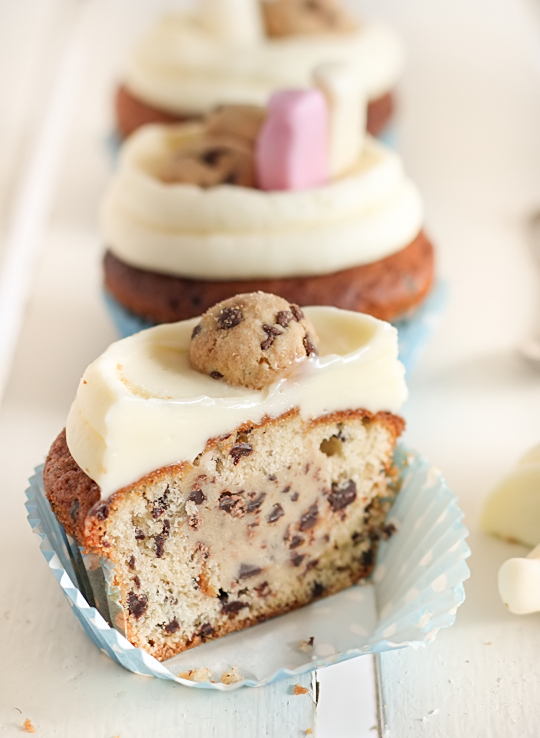 I love the sound of condensed milk icing, what a winner idea! Your creations are always completely incredible! I've still not made your condensed milk frosting but it's next on my list of things to do as it sounds a-mazing. 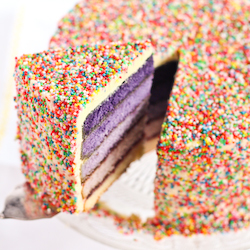 I'm making a cake for a friend inspired by a cocktail - do you think I could add alcohol to the frosting, and if so, do you have any idea how much? This looks so fresh. That was the first word that came to mind :D I love them! Well that's surely the best way to deal with comfort eating after a bad week then just sitting and eating your way through anything to hand (i.e. me)! OMG! These are beyond adorable. You inspire my creativity. Thank you. I LOVE the cupcake toppers! I think they're probably the cutest cupcake toppers I've ever seen! Adorable!!! These are the cutest things I have ever seen in my life. I'm not kidding! SO cute! I know that stress eating feeling where you can't decide what to eat. 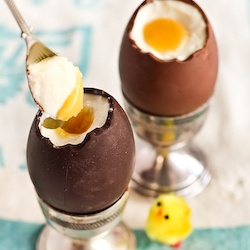 These are adorable, way creative and so cute to boot! Could it get any cuter than that? I don't think so. 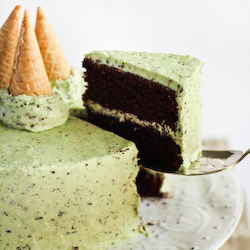 And that frosting! It is at the top of my "must make immediately" list. Just adorable in every way. Then use less frosting on each cupcake, I specified the amounts so that there is a generous amount of icing for each cupcake. Or adapt it to use less butter. Or don't make it at all. OH my, the cupcakes look wonderful. These are just too cute! Such a fun idea. 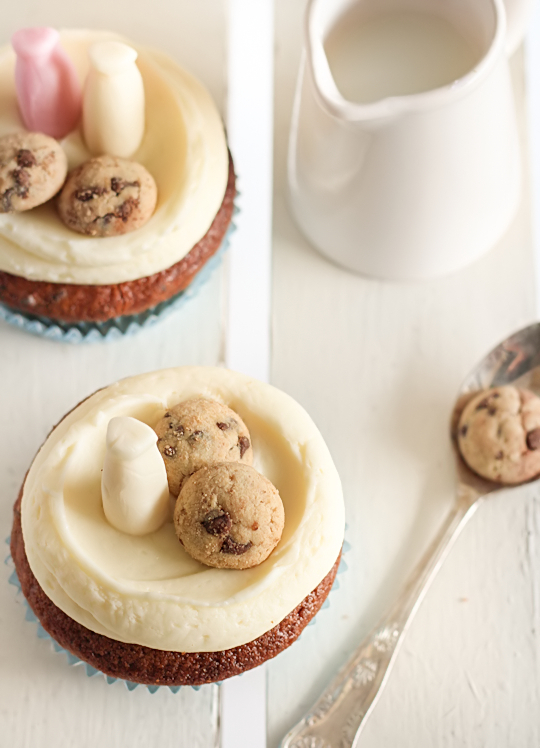 And how did you make those tiny milk and cookies on top? So awesome! Yum! I do the complete opposite when I'm stressed and stop eating! Keep smiling! These are too cute for words! I absolutely adore the milk and cookies topping and the idea of sweetened condensed milk (which I practically drink straight from the tin) in icing is inspired! First of all, PRECIOUS! I would love to know where the little milk bottle candies came from as well as what brand the little cookies you used are. Thanks for any help you can give me! Jeeeezus, I want these in my belly right now. 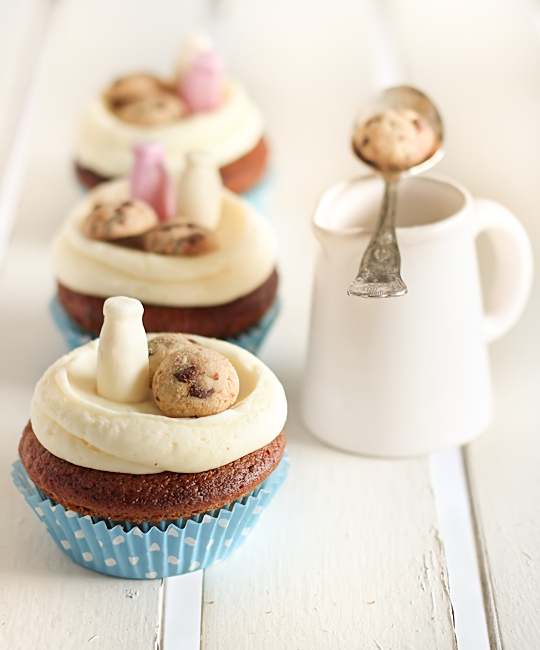 Love the touches of the mini cookies and milk bottles to the tops. 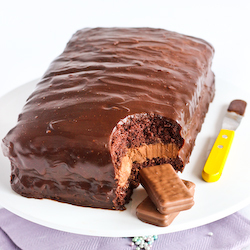 Your baking creativity is off the charts! I made these cupcakes today and they taste amazing! But only problem was that the tops were very crumbly? They were no where close to looking like your cupcakes. Was the dough for the batter suppose to be thick like cookie dough? Ack, I just realised there was a typo in the recipe, it should have read 1 & 3/4 cups of flour not 2 & 3/4. If you followed the cup measurements it could explain why your batter was very thick? I'm so sorry!! I have updated the recipe now. Oh thank you!!! It's ok the still came out great! Lol just crumbly. Too cool! I will give them a go, love a bit of "comfort" food too. omg! it looks delicious, lovely, so sweet.. i wish a could cook like you! I have been crazy addicted to cookie dough for the past few days after making some truffles. These cupcakes look amazing! I don't mean to be rude, but I baked these cupcakes last night and they turned out extremely dry. I followed the directions exactly, but they still turned out this way. Were your cupcakes dry? No my cupcakes were not dry. If yours were dry then they may be overcooked. Each oven varies in its baking times, you need to make your best judgement on the baking time based on your own oven. Hence the non-precise timing in the recipe 'Bake for about 20 minutes or until cupcakes are golden brown and a skewer inserted into the centre of a cupcake comes out clean'. I have used this recipe many times with success, as have other people. I love that the cupcakes still look a bit "wet" on the inside. They must be absolutely delicious! I have a cupcake blog called My Year of Cupcakes. 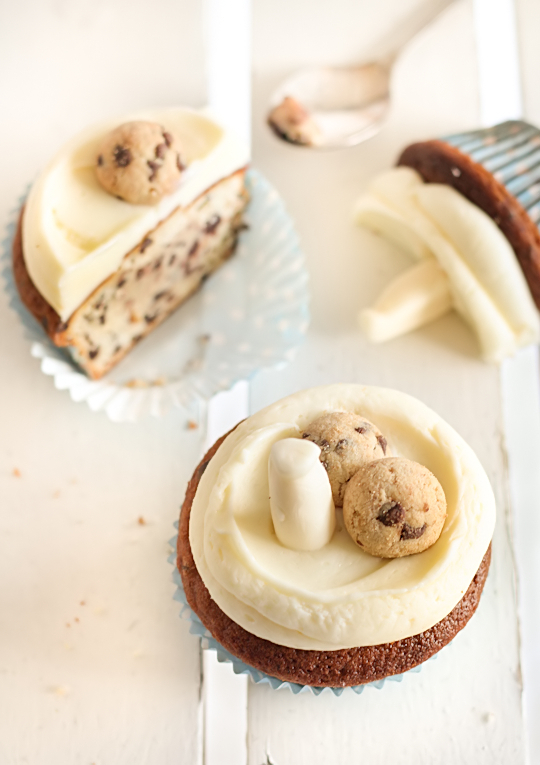 I featured your Milk & Chocolate Chip Cookie Cupcakes on Day 27. Here's the link if you wanna take a look! It'll compete tomorrow for the Monthly Champ! Thanks again!! I made these and they were delicious! Only thing is the 3 sticks do butter were overbearing in the frosting. I think the frosting was way too buttery. But nonetheless they were good! I got a stand mixer for my bday this week and this was the first thing I made - thank you for the recipe :D for once my cupcakes were fluffy on the inside with a crispy top. The condensed milk icing is delicious! These look adorable! Love the condensed milk frosting idea. Where do you get the miniture milk candy?